In practice for 20+ years, I've been supporting those with trauma using body-oriented healing techniques, and supporting clinicians in this. You come from all walks of life, and yet, one thing is shared in common: you all struggle to step into the world as your true selves in a way that feels effective and satisfying. Trauma impacts everything, from your relationships to self and others, to your purpose and career, and to your experience of the beauty of life. You have tried talk therapy, and you are so done with that! I help those who want to live fully, embodied and present. As both a licensed clinical social worker and massage therapist, I employ not only EMDR and Voice Dialogue to address the more specific traumas and the fragmentation that trauma survivors experience, but also Somatic Experiencing and Craniosacral Therapy to address trauma where it is stored: in your body. As a second-generation mental health worker, I've spent all my life wondering at the human capacity to heal, both individually and as a society. 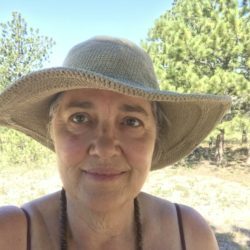 My activism as a woman and a lesbian has guided my early involvement in politics and nonprofits, starting the Gay Lesbian Association of Durango in the early 90's, which actively included trans people and hosted a hotline. As the facilitator for the Child Assault Prevention Program, I served the local community's empowerment in addressing child abuse at the source, and have worked with abusive parents as a group facilitator for Parents Anonymous. It is my belief that the community has the power, as each member brings forth their own individual gifts, to address the marginalization that stands in the way of a vital and inclusive world. My goal as an individual and group therapist is to strengthen my clients' abilities to connect more deeply, and find that within which is of value to them, and to lend it to a society in need. We need, as humans, to connect; our survival craves this at the level of food, water, and shelter. Yet we live in a world where people are profoundly lonely, separated from each other, unable to make more than unsatisfying superficial contact. My attachment-oriented work is based on Fosha's brilliant model, and I'm a member of the Denver Chapter and have presented to the group on somatic work. EMDR, when done effectively, can be a profound remedy for shock trauma often resulting in PTSD. Preparedness for this includes the development of a contemplative practice, in order to allow the mind to truly roam the matrix of meaning, and the embodiment of the client. My skill in both these areas, honed in supervision groups and advanced trainings, including those with Dr. Shapiro, allow my clients to experience considerable benefit. Trauma is more that what we think, it is stored in the very tissues of our bodies. My use of Somatic Experiencing and CranioSacral therapy assist your body in finally unthwarting the stress that, in many cases, has been stuck there for years. Think of anxiety not necessarily as an emotion in itself, but the fight-flight-freeze that results when our emotions have become overwhelming, or when we have been encouraged to suppress them instead of learning to channel them in health-positive ways. My work addresses the biology of stress, supporting the body's ability to return to the rest-digest (parasympathetic) state which allows for better sleep, less emotional reactivity, and a healthier digestion. There's PTSD, the result of a single, overwhelming incident that leaves us disengaged from others, replaying the terrifying incident over and over, unable to find ease. Then there's Complex PTSD, the result of years of abuse and neglect children suffer, when they instead needed to learn the developmental tasks of trust and relating to others, of developing competence and cultivating lifelong curiosity. My attachment-focused work helps clients step into themselves, and then the world. Being embodied allows us to experience all of our emotions, and tap into our holistic intelligence, in a way that brings out the best in us. Yet, many who grew up in abusive and neglectful homes learned the only way to protect themselves was to leave this crucial, vital awareness behind. We also live in a society that encourages intellectualization, robbing us of our heart-felt humanity. I work somatically to address this, getting clients out of the "talking chair" and engaging their whole self.